The president of the permanent council of the Organisation of American States (OAS), Francisco Proano, has resigned a day before he was due to convene a special meeting of the regional body. Colombia has called the extraordinary session to formally complain about Venezuela allegedly tolerating Colombian rebel camps on its territory. Mr Proano says he had come under pressure from his home country, Ecuador, to postpone the meeting. He has been replaced by Joaquin Maza. Mr Maza, who is from El Salvador, has said the meeting will go ahead as scheduled on Thursday. Colombia requested the session last week, to allow it to present evidence it says it has that Venezuela is providing a safe haven for left-wing guerrillas. The Colombian government says it has proof that five rebel leaders are sheltering across the border in Venezuela and planning attacks from there. Venezuela has denied the charge. 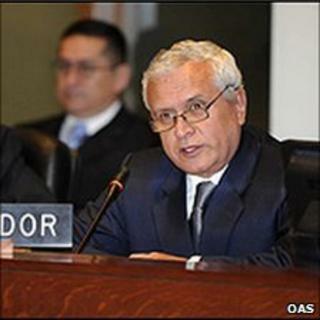 Mr Proano, who had been holding the rotating presidency of the permanent OAS council since July, said the Ecuadorean foreign ministry had asked him to postpone the meeting to "give dialogue a chance". Faced with the choice of breaking OAS rules, which demand the session be convened if a member state requests it, and going against the wishes of his foreign ministry, Mr Proano said he had decided to resign. Relations between Ecuador and Colombia have been strained since Colombian forces attacked a Farc camp in Ecuador two years ago, killing a senior rebel leader.